As lunchtime springs into action at Park Forest Middle School, food service supervisor Chris Meckley goes with the flow. Perched at a register, she has no choice. One after another, sixth graders bring burgundy-colored trays full of pizza slices, chef salads, fruit chunks and colorful raw veggies. Meckley keeps up, logging their meals with friendly banter, until the chattering rush ends. She and her staff of 10 do a brisk business, about seven minutes to serve each of three lunch periods, but efficiency is just one of their hallmarks. Everywhere, extra touches create a warm and inviting bistro atmosphere. At the Lion’s Paw Pizza and Pasta serving line — one of four daily options for students, along with the All-American Café, the Little Lion’s Lunch Box and the Express Café — hanging red and green flags lend a bit of Italian trattoria flair. Menu boards sport cheerful pink, green and yellow lettering. Appealing photos illustrate entreés like in a menu, and walls serve as a gallery for contemporary paintings of fruits and vegetables done by a local artist. And the food? Let’s just say these aren’t your father’s middle school lunches, or even the ones you may remember. The staff makes its own lasagna, sloppy joes and other dishes, and artfully prepares cut fruit displays and freshly-made salads. A Thanksgiving turkey feast comes with a relish tray and homemade stuffing and apple crisp. All of it, including daily breakfasts, earned Meckley’s cafeteria a rave review: a high gold rating score this fall in the national Smarter Lunchrooms Movement assessment program. The national average is bronze. “My team works very hard, and it’s nice to be recognized for what we do,” Meckley said. Run by the Cornell University Center for Behavioral Economics in Child Nutrition Program, the federally-funded Smarter Lunchrooms Movement program aims to “equip school lunchrooms with evidence-based tools” that improve children’s eating behavior and health. According to the program, “smarter lunchrooms” demonstrate core values that include low cost/no-cost solutions, lunchroom environment focus, promotion of healthful eating behaviors and sustainability. In the spring, Smarter Lunchrooms evaluator Cynthia Dawso Van Duff gave Park Forest’s cafeteria high marks — a score of 72 out of 100, good enough for a low gold rating. She called the visit “a pleasure,” praising the well-lit, decorated service areas; the fruit and vegetable bar that included a hard-carved fruit display; the variety of entreé and side dish choices; the cleanliness of the service and prep areas; and the “engaged” and “polite” staff. But Dawso Van Duff also had several suggestions, including enhancing the menu boards, removing mops and other clutter from view along a dining room wall, and adding a fourth serving option, the Express Café. After Meckley made the changes, a second evaluation in the fall boosted her score to 91, among the best in the state. For Meckley, her daily work is all about student learning. To that end, she makes sure her menus do more than simply list the day’s choices. She adds mini-nutritional lessons, including more than the important vitamins and minerals. 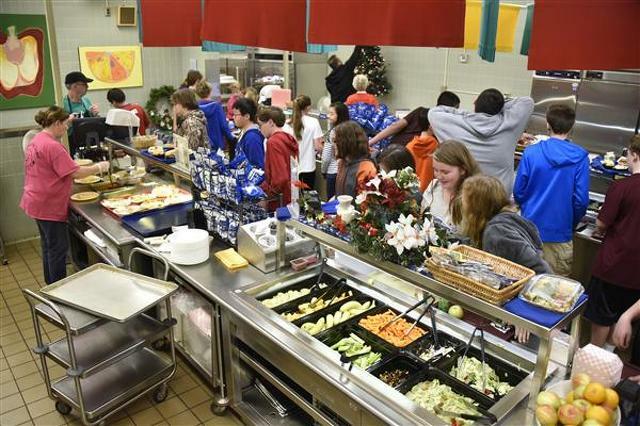 Meckley’s other practices reflect values developed over 14 years with the district food services, the first seven at Mount Nittany Middle School before moving to Park Forest. Details matter. Meckley takes pride in flourishes such as carved watermelon fruit baskets, shaped fruit chunks and creative serving displays. Silverware is available not only at the start of lines, but also at the exit in case a student forgot or picked up an unplanned item. Creativity helps. Sample trays show different options for sandwich fixings. Baskets of fruit sit by each register. Freshness counts. She serves local produce and fruit as much as possible, and her staff prepares many offerings from scratch, such as breakfast scones, hummus, bean and potato salads, roast turkey and pulled pork barbecue. Why go the extra lengths? Simple: The customer comes first. They’re her inspiration, her muses. Last year, she surveyed students for their preferences, often just walking around and asking questions. Teachers also relay comments. Most importantly, Meckley listens. Students said they like having breakfast in their home rooms. No problem. They can grab a pancake and sausage on a stick, bagel egg sandwich, muffin, scone, honey bun or yogurt parfait from a cart near the main entrance and then eat away from noisy crowds. Some said they don’t like waiting in lunch lines. Got it. The new Express Café offers quick grab-and-go sandwiches, salads, and hummus and pita plates — a boon especially for those wanting to eat with friends who packed lunches. Others said they wish to expand their culinary horizons. Can do. In serving lines, Meckley and her staff encourage experimentation. The district’s food service program has received other recognitions in recent years. In an informal assessment, Dawso Van Duff praised the Mount Nittany Middle School cafeteria. Overall, SCASD was one of only two school districts in the state to receive a $26,335 demonstration site grant in 2015 under the Seed Change program, a state-level initiative of the National Farm to School Network. The grant was awarded in part because of the food service program’s support for school gardens and local agriculture. As a demonstration site, the district shared its farm to school expertise with 24 school districts awarded a Seed Change mini-grant. Even within a culture of high standards, however, Park Forest Middle School’s cafeteria stands out. Meckley considers it all a pleasure. She loves chatting with students and seeing her staff do the same, that they can provide some sunshine on the side. Just as satisfying, she knows they’re nourishing not only minds and bodies for the day, but also good eating habits that may last a lifetime. Chris Rosenblum is communications director for State College Area School District. For a game that lasted just over three hours, perhaps as long as this weekend's commercial filled Super Bowl, it renders much of the first-half-turned-ancient-history useless when it comes to summarizing the evening. So to get to the point, Penn State lost 110-102 in triple overtime on the road at Indiana on Wednesday night.